New materials can really spice things up -- carbon fiber allowed tennis players to get balls off faster, while sheep intestine did pretty much the same thing for everyone else. Rethinking what they put in their shoes: Unstitched Utilities. From three buds who realized they were too caught up in their corporate jobs (Puma, Pony, FILA...) and wanted to get "unstitched", UU's inaugural drop features kicks made from Tyvek, traditionally used in "house wrap" and USPS envelopes due to its being lightweight, breathable-yet-weather-proof, and "stronger than leather", though it'll need to be tougher than leather if you want to wear it during a long run DMC. 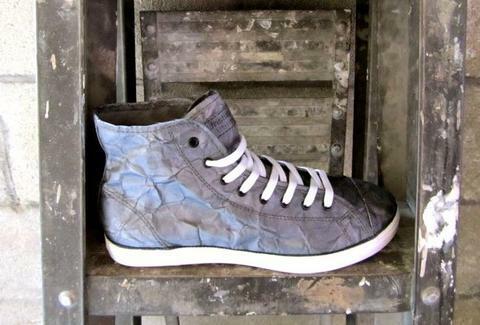 Possessing a wrinkled & worn look look, Tyvek comprises the body of the Next Day Low, a thick-rubber-soled, PF Flyer-esque lace up ankle-shower avail in four solid colorways (with contrasting eyelets), and the Next Day Mid, reminiscent of Chuck Taylor All-Stars, though strapping envelopes to your feet won't make you The Mailman. Featuring more common components, the Strap Down's a hi-top made from leather and ballistic mesh and rocks a namesake vertical ankle belt, and the also-hi-top Magma rocks two pop-able flaps on top, a combo of full grain/patent/croc print leather, and's inspired by an "old hockey boot", also a frequent occurrence given how much they drank and fought. Because they believe green should be "the way we all live our lives", a percentage of their proceeds'll go to environmental causes all around the globe, perfect for anyone who's discovered the benefits of being a true nature lover.